12 Speaker Set of Speakers for. BMW 3 Series (E46) Sedan, Coupe, or Convertible. BETTER Than OEM Harman Kardon BETTER Than the Bavarian Soundwerks' (BSW). "Upgrade" BSW charges you DOUBLE to include a sub-woofer. BSW has stood up and taken notice! They have called us out and said, ... That's exactly what we are and are damned proud of it. We sell from our garage what they charge you more than TWICE as much for! You'll also notice how they don't refute any of our assertions We thank you, BSW, for noticing us! You can rely on our 25 years experience in equipping. E46's, E9X's, F10's, F30's and even R50 & R56. This is the ULTIMATE Audio Upgrade Kit Available For your BMW (E46) Sedan, Coupe, or Touring Period! ALL OF THIS DIY Hardware & Installation Kit is INCLUDED. What You Get: Twelve (12) Speakers Total. Speakers cant even come close! HEAVY Duty Magnets (Sub-woofers, Woofers, and Mids). Aluminum Cones in EIGHT Drivers. Neodymium Magnets for high efficiency & superior audio imaging (Tweeters only). Rubber Surrounds (not foam like OEM Harman Kardons). In your application they divide the work three ways. These will snap in to your stock speaker holders. 3,500 to 25,000 Hz. Compact neodymium motors have low stray field. Extremely flat and extended response. (4) Mid Range This FULL Range Mid-Driver is the weak link in the OEM System. These Drivers are over-engineered beyond the systems frequency range requirements. With a little basic modification, you simply swap and drop using your stock speaker holders. 85 to 20,000 Hz. Voice coil with polymide former. (4) This 6 woofer driver sets a new standard of value in high-performance loudspeaker drivers. Combines class-leading low distortion performance with super smooth frequency response due to the use of a proprietary cone blend. Eatures a black cone, heavy-duty 6-hole cast frame, low-loss rubber surround, solid aluminum phase plug, and gold terminals. 45 to 10,000 Hz. Low-distortion motor system with two short-circuit paths. High Excursion black anodized cone. (2) 6½ Classic Sub-Woofer Speaker Installed inside OEM Enclosures w/supplied adapter rings. 30 to 4,000 Hz. Para-Aramid Synthetic Fiber Coated paper cone provides smooth response and reduced breakup. Large diameter flat spider and excellent "Excursion" for clean bass. Double Connecting Posts for parallel wiring (required). Ideal for vented enclosures such as your BMW. (1) 10 Reference Series 700 watt Sub-Woofer w/Dedicated Amplifier and Ski Pass Adapter. The main focus of these subwoofers is ultra-low-distortion. Second, third, and inter-modulation distortion are kept extremely low by utilizing three short-circuit paths within the motor structure. Kevlar spider and extensive venting throughout providequiet and uniform excursion. The black anodized cone, rubber surround, and custom basket give this driver a unique, high-end look. Choose THIS high fidelity driver for your system when you are looking for clean, low, tight bass that you'll feel in your chest. 22 to 1,000 Hz. Extensively vented motor eliminates compression and allows quiet excursion. Lightweight black anodized aluminum cone for rigidity and lower moving mass. Suitable for sealed or vented enclosures. Triple shorting ring motor for ultra-low distortion. 2-layer coil for reduced back EMF. Highest quality materials throughout for long-lasting performance. 350 watt Rockford Fosgate Amp Included. Ski Pass Adapter Plate Included. (1) Installation & Hardware Kit. These Adapters are CUSTOM FABRICATED for THIS application. Get these adapters or kit anywhere else! (2) Pairs of 6 CUSTOM adapter rings for Component Woofer drivers with fastening hardware. (1) Pair Adapter CUSTOM Rings for Sub-Woofer drivers. 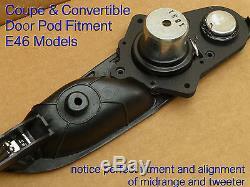 Pair of coupe door speaker pod adapters for tweeters + mids. (8) pairs of metric m6 ×. 80 bolts with lock nuts for sub-woofer adapter rings. (7) pairs of female connectors for all 12 speakers. 105" sizes for "'+" and "- terminals respectively (6 for speakers + 1 for parallel connection). 7' Speaker Cable (for splicing and parallel connections). ALL Included at no additional charge. (1) One set of instructions and needed tool list for correct installation and wiring of speakers. Only these basic tools required. Set of Flat, Philips and Torx head drivers. One pair of 16 gauge straight-cut metal shears. One set of basic wire cutting & crimping tools. Box Cutter type or Craft Type Knives. Rotary Cutting/Drilling Tool (for drilling and cutting plastic). Our Speaker Pricing is absolutely consistent. We base our prices on the value of each speaker. NOT on how much we think you will pay based on how new and expensive your car is. 2½", 4", 6", 6½", 8. Get this Great Set of Quality Speaker Drivers for 58% HALF OFF! THAT'S LESS THAN HALF PRICE! Fiberglass Impregnated Kevlar Coated Layered Composite. (stamped to look like more exotic material). A Quick Course on Speaker Cone Materials. Four Different Types of Speaker Cone Material. Location Utilized in our Application. The best thing about PLASTIC(polypropylene) cones is that their manufacturing uniformity is very high and inexpensive to produce. Some people argue that plastic cones tend to not sound as snappy or lively as stiff paper cone counterparts. This can be attributed to an almost capacitive storage effect inherent in soft cone type drivers. If well engineered, a well damped plastic diaphragms can excel at mid-range frequencies and at a fraction of the cost of producing a quality paper cone driver. We don't use plastic. Good-to-excellent self-damping, potentially excellent resolution and detail, very flat response potential, and a gradual onset of cone breakup. It can be used with low slope linear-phase crossovers without much trouble. Paper is a material that sounds better than it measures... This is an genuine asset, not a disadvantage. We don't use plain paper. Light and stiff, using an almost infinite variety of fibers, paper composite can be engineered to meet almost any requirement. Treated/coated paper cones largely address the issue of degradation due to atmospheric conditions. The effectiveness of these treatments varies, depending on the specific technology. Paper remains one of the best possible materials for cones. Some of the better paper technologies include:Carbon Fiber, Composite Sandwich (CSX), 5 Layer Composite (HDS), Poly-glass, Slitted Paper, and Kevlar (Poly-Aramid Fiber). Warmth of Sound + Benefits of Material Added. Paper / Kevlar / Glass Composite Cone. These drivers use a proprietary paper cone formulation combining natural paper pulp and synthetic Kevlar® and glass fibers to create an advanced non-woven fiber composite that delivers the perfect combination of excellent detail and smooth, natural sonic character, plus a distinctive, classy look. The performance of the original groundbreaking Reference Series from Dayton Audio, now available with a paper cone! The Reference Series Paper drivers use a proprietary paper cone formulation combining natural paper pulp and synthetic Kevlar® and glass fibers to create an advanced non-woven fiber composite that delivers the perfect combination of excellent detail and smooth, natural sonic character, plus a distinctive, classy look. Kevlar (Poly-Aramid Fiber) Coated Cone. It features a non-pressed treated paper cone, rubber half-roll surround, ASV voice coil, vented pole piece, coated cloth dust cap, and excellent low frequency response. A non-pressed treated paper cone, rubber half-roll surround, ASV voice coil, vented pole piece, coated cloth dust cap, and excellent low frequency response. (Carbon Fiber, Kevlar, Aluminum, and other High-end Ceramics and Composites). Some of these materials such as Kevlar and Ceramics, are used for extremely high end custom speaker manufacture and are therefore cost prohibitive. We will be using Aluminum as our example. Aluminum: Increasingly produced by a number of manufacturers. Metal cones exhibit the least distortion and coloration in the pass-band of any cone material, combined with excellent group delay characteristics. The DIY'er should definitely consider using aluminum for full range, woofer or sub-woofer applications. Mid-Ranges & 10 Sub-Woofer Upgrade. An efficient, low-distortion Neo-Balanced motor is combined with a rigid yet lightweight aluminum diaphragm, yielding impressive high-impact audio reproduction. Second, third, and intermodulation distortion are kept extremely low by utilizing three short-circuit paths within the motor structure. Kevlar spider and extensive venting throughout provide quiet and uniform excursion. PLEASE NO LOW BALL OFFERS! When You Could Install THIS!! Compare the O EM and Bavsound Coupe Speaker Pod. 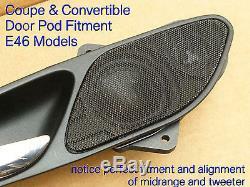 To OUR Exclusively Designed E46 Speaker Pod for HUNDREDS less! Why Install these paper/foam Drivers that fall apart and crumble? When you can Install THESE 2½ Aluminum/Rubber Cone Drivers? Check out our meticulously designed and engineered fitment. This what you'll see through your speaker grilles. This is the rear view of your speaker pod. Can you tell the difference between the factory and Upgrade Driver? Sample of 6" Woofer and 6½" Subwoofer Installed in their adapters. Compare your old, tired, factory HK tweeter. With our new high efficiency Tweeter. Efficient design for larger tweeter/smaller magnet. Ferrofluid motor for crystal clear highs without shrillness. We are an AUTHORIZED RESELLER of these Audio Speakers. And PROUDLY sell them to you at a fraction of Integral Audio or BavSound. The BEST speakers for YOUR BMW. 5 out of 5 stars. I bought these speakers to replace the rather specialized and highly distorting HK's in my BMW 330CiC door. As hard as BMW tried to inhibit upgrading their speakers these were a pleasant drop in replacement. That's just what I was trying to accomplish. YOU CAN RELY ON OUR EXPERIENCE FOR EQUIPPING. Thank you great value and great customer service........ Reply by mods4bimmers (Jul-08-15 08:38). Always a pleasure getting a customer's order JUST RIGHT! Integral Audio Speaker Upgrade for BMW 3 Series (E46) cars w/ Harman Kardon (#281160702868). Best Offer Price was Accepted. Turned my little white convertible into a thundercloud!! Reply by mods4bimmers (Jun-23-15 10:12). Enjoy your awesome new Subwoofer. Rockford Fosgate Ski Pass Through Subwoofer Kit for BMW E46 Sedan, Coupe, Conv (#281648544737). Reply by mods4bimmers (May-22-15 12:44). Quality Speakers + Attention to Detail Customer Service = Happy BMW Drivers!! Confusing description lead to numerous fitment issues. Reply by mods4bimmers (Feb-24-15 14:48). We walked customer thru install and now happy. Reply by mods4bimmers (Nov-29-14 15:55). BMW 3 Series (E46) Harman Kardon Speaker Upgrade - Complete 12 speaker Solution (#281160702868). Reply by mods4bimmers (Nov-18-14 20:53). Happy BMW Drivers are our BEST Product. BMW E9x (e90, e91, e92, e93) Sedan/Coupe Carbon Fiber Interior Dash Trim Set (#281260824089). Reply by mods4bimmers (Aug-28-14 10:50). World Customers can shop with Confidence!!! Reply by mods4bimmers (Jul-07-14 11:21). Reply by mods4bimmers (Jun-09-14 11:03). Awesome Speakers make for Happy BMW Drivers! 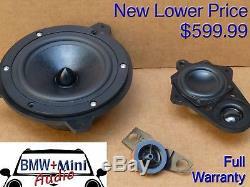 BMW 1 Series (E81, E82, E87, E88) Speaker Upgrade Kit -Total 8 Speaker Solution (#281265266738). Reply by mods4bimmers (May-07-14 10:10). AWESOME Speakers make for HAPPY BMW Drivers! Reply by mods4bimmers (May-06-14 15:51). Happy BMW Drivers are our BEST product! Quality product, delivered as ordered. Reply by mods4bimmers (May-02-14 13:59). The number of Happy BMW Drivers continues to grow! Reply by mods4bimmers (Apr-22-14 12:53). BMW 3 Series (E90 E92) Speaker Upgrade Kit-Total 11 Speaker Solution (Logic 7) (#281207121727). Can't wait to get them installed. Reply by mods4bimmers (Apr-11-14 14:23). So glad you're happy with your kit. Reply by mods4bimmers (Apr-11-14 14:22). Happy BMW Drivers are our BEST product. Speaker upgrade kit sounds great and fits well, some need little mods. Reply by mods4bimmers (Feb-04-14 10:24). Little mods as per instrutions. If you need additional tips, we r ready to help. Reply by mods4bimmers (Dec-05-13 21:00). Customer has the right to change his mind. BMW 3 Series (E90 E92) Speaker Upgrade Kit-Total 11 Speaker Solution (Logic 7) (#281024637236). Items arrived as described and work very well. Reply by mods4bimmers (Oct-15-13 22:08). BMW 3 Series (E46) Harman Kardon Speaker Upgrade - Complete 12 speaker Solution (#281103676824). Great customer service, satisfaction guarantied! Reply by mods4bimmers (Oct-14-13 09:12). Reply by mods4bimmers (Oct-08-13 13:32). Reply by mods4bimmers (Sep-16-13 14:59). AWESOME Speakers make for ANOTHER Happy BMW Driver! Reply by mods4bimmers (Sep-04-13 11:39). Reply by mods4bimmers (Aug-13-13 11:39). Reply by mods4bimmers (Aug-23-13 09:00). Reply by mods4bimmers (Jun-18-13 09:52). BMW 3 Series (E46) Harman Kardon Speaker Upgrade - Complete 12 speaker Solution (#281097222015). I got a great speakers for my BMW. Reply by mods4bimmers (Jan-08-13 07:46). BMW 3 Series (E46) Harman Kardon Speaker Upgrade - Complete 12 speaker Solution (#281042185247). Your the best I dealt with in E-bay. Reply by mods4bimmers (Jan-09-13 07:46). 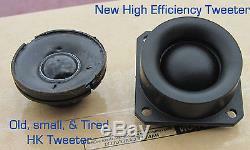 BMW 3 Series (E46) Harman Kardon Speaker Upgrade - Complete 12 speaker Solution (#280891445868). Reply by mods4bimmers (Oct-06-12 16:18). I Even helped out with a few installation tips... Reply by mods4bimmers (May-11-13 11:36). Another Happy BMW Driver, Motoring down the highway listening 2 awesome speakers. BMW 3 Series (E46) Harman Kardon Speaker Upgrade - Complete 12 speaker Solution (#281068480968). Here are more reviews from DIY Internet websites. It took a little engineering to get everything to fit, but WOW!!! There is no comparison to the HK system. I don't think I had ever realized the The Eagles "Witchy Woman" had RAVEN hair!!! You will not be dissapointed. " 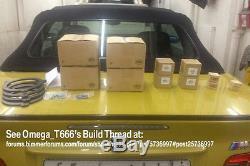 --Steve - 14215 August 15, 2008 "I bought these speakers to replace the rather specialized and highly distorting HK's in my BMW 330CiC door. " 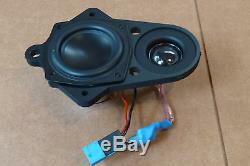 --Bimmer Driver-October 31, 2011 "Used this speaker as a replacement for my BMW M3 E46. The polarization question mentioned in one of the other reviews can be solved by connecting your old speaker to a battery (like AA) and noting the direction the cone moves for a given battery polarity. Repeat with the new speaker. Match the speaker terminals so that the new cone moves in the same direction as the old one. I bought this to put in as a midrange in a project speaker i was building. I can find nothing to complain about. For the price they are the best speakers your going to get. Appearance is is really pretty good as is build quality. Don't go to the trouble of fabricating your own MDF (medium density fiberboard) adapters like you see in so many DIY's Use our custom adapters for that custom fit. Think of it as "Swap & Drop". While this is absolutely a DIY Level Project Kit Professional Installation is Highly Recommended OR Customers should be comfortable with the Following Procedures. Tweeters: you will have to pop out the driver from the holder and splice the connector back on. 2½ Mid-Drivers: The driver in the kit was chosen because of its matched impedance and its four squared ears with holes in them. This means that you'll have to snip away some material to make them fit. The front door drivers have to be rounded off. The rear door drivers need to have the tabs have material cleared away to allow them to attach to the threaded ring that holds them to the door. I will provide the two screws to attach them. You then splice the factory connector onto your new assembly. 6 Woofers: These are the easiest to do. Custom adapters are included (4). You can disregard the factory connector and simply use the blade connectors directly. 6×9 Sub-woofers: Another custom pair of adapters is included. It will allow you to install my 6 Driver into the factory 6×9 enclosure. The speakers have double posts for parallel wiring. This will help you MATCH the speakers' impedance to your HK amp's specs. The stock subs run 32 watts at 2ohms. In small percentage of E46 BMW's a small 3¾ circle will have to be cut inside sedan's front doors where magnets touch the door structure. We have not encountered problem with Coupes. We don't know why. There will be a 7mm gap between your door and the interior door card panel and will make it difficult to snap door card onto door. Some drivers have reported the ability to leave the door card as-is with no ill effects. ONE Upside reported is that if that once the hole is placed in the door the the door cavity can be treated as a speaker cabinet and filled with acoustic fill. This GREATLY tightens up the speaker's response and volume. With only some basic stereo installation know-how YOU can absolutely Install these Speakers yourself. Great care and research was dedicated to make these speakers simply a swap and drop in solution using the OEM mounts and housings. However, professional installation is HIGHLY RECOMMENDED. If you want to pay to have this installed professionally, your installer will not charge you for custom work but this is certainly an easy DIY project you can do yourself. With additional modification, this set of speakers can be installed on Coupes And Convertibles. Speaker frequencies, and impedances have been carefully matched. Read before using your new speaker. We will gladly help you get the most from you speakers and are at your disposal. We have experience and knowledge to choose the best suitable speakers for your BMW application. Variables such as sound and tone are subjective to the listener. While we do not guarantee the suitability of a specific speaker to a specific application, we provide a period of 30 days from the date of invoice for defective drivers only or if the speakers are HAVE NEVER BEEN INSTALLED and have been auditioned in prescribed manner. Our Reviews are all the testament needed regarding the SUITABILITY of these drivers to your BMW application. To "audition" a speaker without scratching or marking it will require getting it into the speaker cabinet or automobile as these speakers are often utilizes and listening to it play without actually mounting it with screws. This can be done by tilting the cabinet or location back and setting the speaker in place or placing it in its rear (parcel shelf) deck location. If the cabinet has bare wire leads, just wrap them around the solder lug connector on the back, of the speaker to make the electrical connections. A friend can help hold the speaker in place while you listen to the new speaker. This is, of course, not an optimal way to listen to a speaker, but will give you the opportunity to identity major response problems or poor tonal characteristics prior to mounting or installing. The speaker must be in like new condition. This includes no mounting marks or scratches especially. Around the mounting holes, no solder on the connectors, no sealing caulk, dirt, sawdust (from car adapters), or other debris. Package the product to protect it from damage' in route to us. Insure the package for the value of the product. Customer will file a claim with. Packaging may be cause for some shippers such as UPS to deny damage claims. Speaker defects occur even in-the most expensive of speakers from the most respected names in the business. Characteristics of a burned voice coil. Discolored or black spider around base of cone. Add a map to your own listings. The item "BMW E46 Sedan/Coupe/Convertible Speaker Upgrade Kit for cars withHarman Kardon" is in sale since Friday, November 11, 2016. This item is in the category "eBay Motors\Parts & Accessories\In-Car Technology, GPS & Security\In-Car Entertainment\Speakers".audio" and is located in Laredo, Texas. This item can be shipped to United States, Canada, United Kingdom, Denmark, Romania, Slovakia, Bulgaria, Czech republic, Finland, Hungary, Latvia, Lithuania, Malta, Estonia, Australia, Greece, Portugal, Cyprus, Slovenia, Japan, China, Sweden, South Korea, Indonesia, Taiwan, South africa, Thailand, Belgium, France, Hong Kong, Ireland, Netherlands, Poland, Spain, Italy, Germany, Austria, Israel, Mexico, New Zealand, Singapore, Switzerland, Norway, Saudi arabia, Ukraine, United arab emirates, Qatar, Kuwait, Bahrain, Croatia, Malaysia, Brazil, Chile, Colombia, Costa rica, Panama, Trinidad and tobago, Guatemala, Honduras, Jamaica, Barbados, Bangladesh, Bermuda, Brunei darussalam, Bolivia, Ecuador, Egypt, French guiana, Guernsey, Gibraltar, Guadeloupe, Iceland, Jersey, Jordan, Cambodia, Cayman islands, Liechtenstein, Sri lanka, Luxembourg, Monaco, Macao, Martinique, Maldives, Nicaragua, Oman, Peru, Pakistan, Paraguay, Reunion.